Recently, I received a package from Furicle, containing a kimono won in their weekly lottery! For those who haven't heard of Furicle, they are an online kimono store. They offer secondhand kimono items at reasonable prices, and every week they offer a free kimono item in a lottery. Please check out their website or "like" them on Facebook. Apologies, I didn't have anyone to take my pictures, so blurry mirror pictures it is! The kimono is the color of Autumn, ochre and orangy-brown. To be honest, I completely forgot what the kimono looked like after I had entered the lottery, so when it arrived it was like opening a mystery present! Maybe that is just me getting old! Since I hadn't prepared anything ahead of time to coordinate, I decided to do a sort of monotone ensemble, thinking about the colors of the changing leaves outside. I do not know the flower. At first I assumed it was nadeshiko, but it has 6 petals instead of 5, so I do not know. 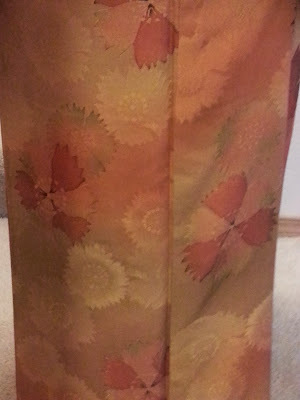 I used a cream nagoya obi that has gold stripes and orange and green karabana, and green accessories, obiage and buckled elastic belt, to echo the little bit of green in the edges of the flowers in the kimono and in the obi. (I did not take out the basting stitches yet, since I am not wearing it for an outing. 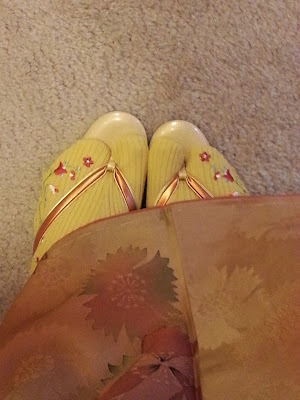 I will remove the stitches before I wear in public) My handmade yellow tabi actually paired well with the ochre in the kimono, but the camera didn't pick it up very well. My new orange Kinwashi-in zouri fit very nicely. The color feels like autumn. While I do not know if the flower is nadeshiko, it think it is probably a type of dianthus flower. © Kimono Life. All rights reserved. The material on this site may not be used without permission . Picture Window theme. Theme images by Ollustrator. Powered by Blogger.